It’s becoming increasingly clear that BT is prioritising rural areas where it faces competition for its initial taxpayer-funded roll-out of next generation broadband. The latest example comes from West Sussex, where BT has already upgraded the coastal belt in its commercial roll-out, and is now moving inland. 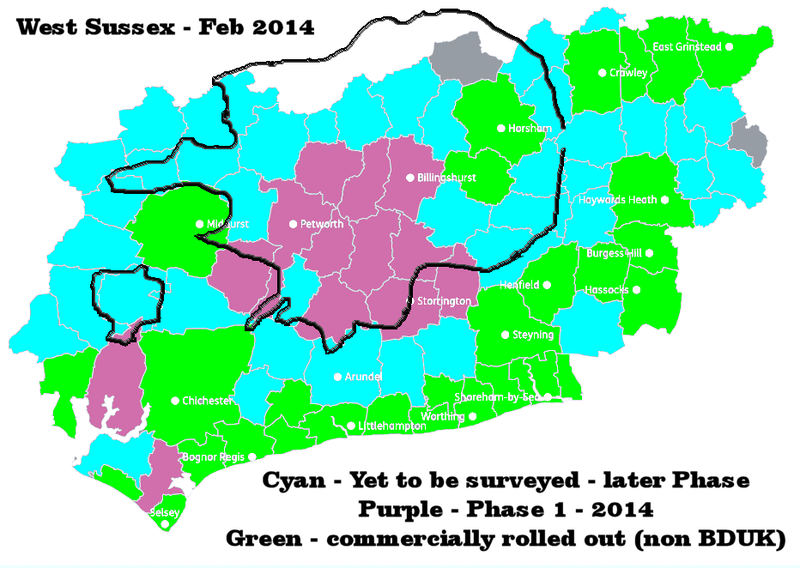 The official West Sussex County Council interactive map (which is not up to date in terms of its colour-coding; it still says the coast is “under evaluation”) does not reflect any choice of suppliers of high speed broadband. BT’s taxpayer-funded roll-out will largely duplicate Kijoma’s privately-funded wireless coverage (outlined in black). However, BrokenTelephone has made a more up to date map which shows roughly how BT’s taxpayer-funded coverage maps onto the coverage provided by wireless internet service provider Kijoma (outlined in black). Interestingly, the WSCC says that two of the exchange areas shown as pink are “partly in the commercial roll-out”. When the BDUK procurement framework was first mentioned, wireless was excluded as not being capable of meeting EU targets of 30Mbps for all, and 50% of the population on 100Mbps service. The European Commission later relaxed its stance on wireless, but BDUK and local councils appear to ignore the change in contracting for next generation broadband networks. We have asked WSCC for clarification as to precisely which areas in Billinghurst and Bosham (bottom left of map, just south of Kijoma coverage) are in the commercial roll-out, and what the time-frame is for the roll-out to the non-commercial parts are. We’ll update this story if we get a reply. Lancashire village of Dolphinholme, where residents have spent time, money and effort digging towards the B4RN network to ensure that their village doesn’t miss out. While BT’s Dolphinholme roll-out looks good in terms of “homes passed”, the actual availability of a fibre connection to those homes not on the road appears slight. The more likely reason for the fibre link is that the road through Dolphinholme leads to a radio mast, and the fibre is there to backhaul mobile radio traffic, not to carry residential broadband traffic. But its presence is a threat to B4RN, which, try as it might, is unlikely to persuade mobile network operators to use its fibre, at least in the short term. Tunstall, another Lancashire village in the B4RN coverage area in BT’s sights, is on the road to Kirkby Lonsdale and there is already fibre in that road. BT is also targetting Whittington, which is the hamlet after Arkholme and Docker on the way up to Kirkby on the opposite side of the Lune valley to Tunstall. Two weeks ago Gigaclear scrapped plans to roll out a 1Gbps-capable FTTP network in the Dun Valley, Wiltshire, after the Wiltshire County Council said it would apply BDUK money to BT’s “up to 80Mbps” FTTC roll-out in the area. This followed months of discussions between residents, Gigaclear and the council as to their roll-out plans for the valley.